The first day … I was finally able to take off and it was quite a relief I must say. Not that it hit home right away, but it was time after having been diagnosed with mono and incessant headaches for six weeks making the time creep by slowly. It wasn’t fun, that’s for sure. I packed the last things (and forgot a few for sure) the night before and bid farewell from my mother and uncle. 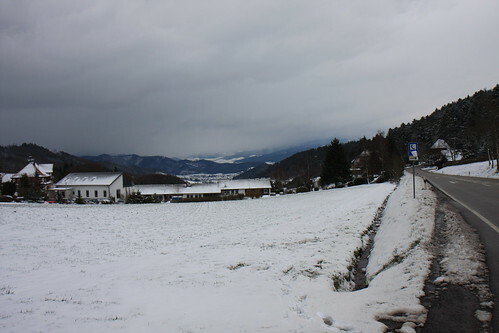 The weather was alright, snow cover on the ground, but with clear roads. It was just above freezing, so not bad at all. My first climb followed soon after, one that I’ve been doing dozens of times and by happy coincidence, the dog that bit me last summer was there to greet me again when I passed a farmhouse. Yikes … but he was good this time around, no bruises this time. 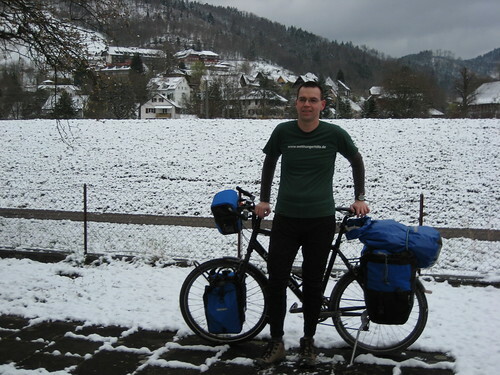 Arriving in Lahr, I met up with Daniel who is a member of a touring biker forum. 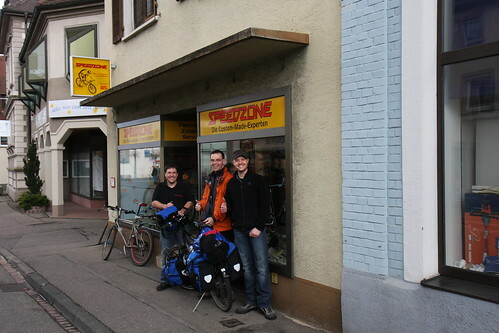 Together we biked to Freiburg, stopping at what I consider to be the best bike store that I know. Speedzone, led by Dieter & Dirk, is a fantastic place and the two are not only the people that put my bike together in a protracted process (more about that at some later point), but have become good friends. Somehow the first casualty occurred right before getting there … I lost my good gloves at some point. But Dieter stuck some gloves into my face, refusing any payment. Thank you for this and everything else!! !The wind wasn’t favorable to say the least. Winds from the Southwest made for a tough going and I was fortunate to have Daniel with me (a big thank you, Daniel). Riding a loaded bike is like pushing a board into the wind and can be grueling if the winds come from the “wrong” direction. But the sun came out and overall made for great riding on the first day. At the end I was pretty exhausted - long illness, hardly any chance to train and probably too little food over the course of the day. After finishing the last purchases (lensbag and footprint for my tent as well as a compression sack - thanks to the Outdoorshop in Freiburg), I spent the evening in the company of a good friend with great food and conversations. Thanks a bunch, Maria. Hold my thumbs squeezed and hope that you keep feeling well! Is this all you are carrying? It doesn’t seem much! Take care and enjoy, enjoy, enjoy! Thanks Nicola, still doing good - more on the blog in the next days. I am now in Samedan close to St. Moritz. And yes, that’s all I have - limited space and weight I suppose.